This book shows the strategy of production line effectiveness and efficiency and shows the how we find out the production rate through computer programming from analysis of mathematical modeling of a un-paced production line as well as manually when the computer programming is fail for higher workstation in production line. Here The developed formula is easiest and fast to calculate the production line. it gives the production rate is highest when the shape of allocation (sequence 1 of work load distribution) is bowl phenomenon (operation time in work station). 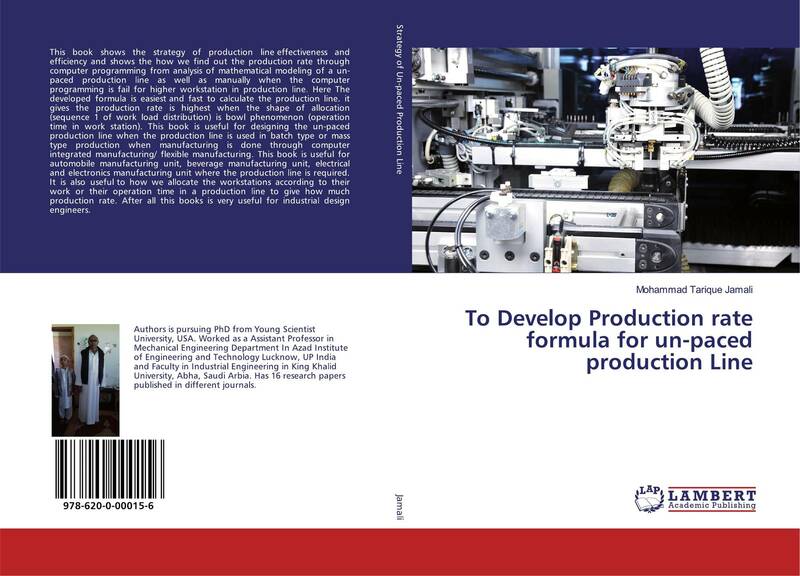 This book is useful for designing the un-paced production line when the production line is used in batch type or mass type production when manufacturing is done through computer integrated manufacturing/ flexible manufacturing. This book is useful for automobile manufacturing unit, beverage manufacturing unit, electrical and electronics manufacturing unit where the production line is required. It is also useful to how we allocate the workstations according to their work or their operation time in a production line to give how much production rate. After all this books is very useful for industrial design engineers.